Ohne Zweifel gehören die beiden Werke zu den Höhepunkten der Literatur für Streichorchester. Fällt Schönbergs „Verklärte Nacht“ von 1897 in eine Zeit, in der durch die Erweiterung und später sogar Auflösung der traditionellen Harmonik alles möglich schien, so sind die „Metamorphosen für 23 Solostreicher“ ein Dokument tiefer Trauer und Resignation, die Strauss angesichts der Zerstörungen des Zweiten Weltkriegs empfand: "Mein Lebenswerk ist zerstört. Meine Werke werde ich auf dieser Welt nicht mehr sehen und hören - ich wollte, Mozart und Schubert hätten mich nach dem 80. zu sich ins Elysium genommen." Doch gibt es auch Gemeinsames: Auch Schönbergs „Verklärte Nacht“ ist in der eingespielten Fassung von 1943 letztendlich eine Verarbeitung der Weltkriegsereignisse, eine Flucht ins Jahr 1897. It is said that really good orchestras can conduct themselves, and this is certainly true for the Streicherakademie who usually play without a conductor. Both Verklärte Nacht and Metamorphosen are large-scale chamber works – the former an orchestral amplification of an original string sextet and the latter a chamber work for 23 solo strings. The execution on this recording is immaculate except for one regrettably flagrant intonation mishap towards the end of the Metamorphosen [22:19]. But all credit to the conductor, Frieder Bernius, who is obviously a tasteful musician. He resists the temptation to wallow in self-indulgent late-Romantic excess and instead treats us to a meaningful sensuousness and constantly shifting drama that is deeply moving. 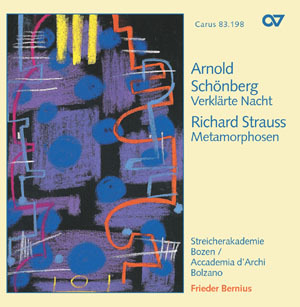 Considering Verklärte Nacht and Metamorphosen were written so far apart, the similarity between the two works is striking, and there is little doubt that Schoenberg’s early work is directly inspired by Strauss’s mature composition. Both pieces resemble each other particularly in structure, style and gesture. They are highly chromatic Romantic conceptions designed as single movement symphonic poems – where Schoenberg condenses five sections into one, Strauss adheres to the thematically tri-partite sonata-form structure. The inspiration for each is drawn from extra-musical sources and it is therefore important to consider these for a proper understanding. Richard Dehmel’s poem about a guilty pregnant girl, consoled by her new lover who insists that her unborn baby will transform into their very own love-child, lends its title and content to Verklärte Nacht. The poetry’s translucent quality is convincingly translated into a musical tongue. The conceptual force behind Strauss’s Metamorphosen is the sadness of the last years of WW2: an "inner", psychological programme that bears no direct relation to events – as does Schoenberg’s oeuvre – but expresses a particular emotional quality. As I said earlier, but for an unfortunately obvious moment of poor intonation, this is a really well polished recording. The Streicherakademie deliver a true chamber music performance, producing throughout a very intimate, homogeneous sound. The effects are lush but contained, and the instrumental interplays are seamless. The acoustics are, however, unforgiving – as though one were sitting through a live concert, every little detail can be heard: no ‘soft-focusing’ here. With a lesser performance this would be a disaster, but in my opinion, the vulnerable acoustic actually works in its favour. The wispy disturbances give a mark of authenticity. My single subjective criticism is that the Streicherakademie fail to highlight the solo events within the works. But this has to do with their aesthetic approach – a consistent chamber music democracy over a hierarchical sound structure. Something in between perhaps? I would have liked to hear the solos sound out a little more, and especially in Metamorphosen where the violin, viola and cello are particularly independent and tuneful. For those who share my preference, let me recommend the 1974 Karajan/Berlin Philharmonic recording of Verklärte Nacht. All in all, an exciting recording. Not least for the powerful climaxes and wonderful palette of dynamics that are anchored in a rich and wholesome chamber music sonority. The depth and power of sound is impressive.